I proudly held onto my iPhone 5 for about seven years, but now it's fun to have a new thing. This iPhone 7 is not as new as the thousand-dollar fake lava lamp, but it suits me. 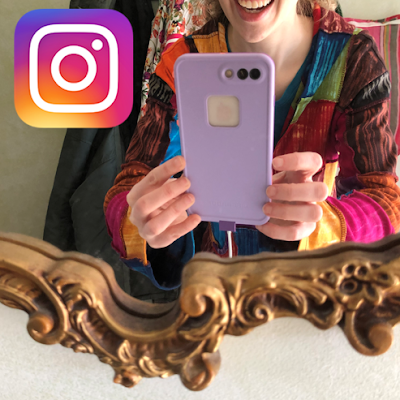 If you follow me on Instagram, you can expect silliness, wicked humor, cute cat pics, creative inspiration, and life hacks for not starving as an artist. Sarcasm, perhaps. Domestic scenes possibly inspired by Amy Sedaris. Lighter fare than what you might find on the Magic Nutshell blog here. But while I have you here, I'd like to relate to you that last night I baked a poppy-seed bundt cake with three sticks of (European-style, of course) butter and six eggs in it. When I opened the oven, the scent was so heavenly that I wanted to motorboat the cake. I did not. Instead, I sliced it up and served it to my family and myself with scoops of honey lavender ice cream from MOO-ville, where the cows are happy and clean and get daily massages (my family has done our reconnaissance on this, and you should too), and then my husband and I left our daughter in the company of her Roblox game, locked ourselves into the TV room with our desserts and a bottle of wine, and screened the majestically disturbing new Rammstein music video as well as the latest episode of UNHhhh with beloved drag queens Trixie and Katya. I didn't take a picture; I'm still figuring out how to capture all those sensations in one little square on a phone screen. Is it the HDR feature? I'll figure it out. In the meantime, follow me to find out what the spots on the inside of my cat's mouth look like. Do you think I'd like your Instagram feed too? You're probably right. If you feel so moved, leave your handle in the comments!